March 18 2019. Virginia Beach delivered the weather as expected, mild, fair and breezy, most noticeably heading north on the Boardwalk. The steady wind of 12-13 mph certainly slowed the times somewhat; I heard conjectures of 20 seconds. With winds from the NNE, you get a tailwind for the first 2 miles, headwind for the next 2.5 and then tailwind again for the final half mile. With marshals on the ground encouraging a safe start, and a standard starting procedure, the race went off without a hitch. 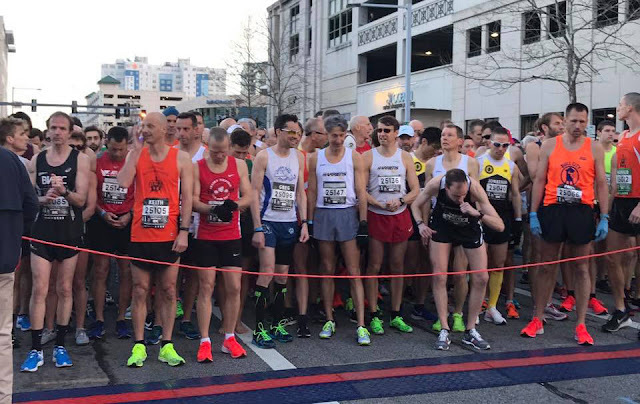 David Angell, of the Roanoke Valley Elite, took off at the horn with Paul Jones, Bull City Track Club and Brian Sydow in hot pursuit, and Mike Cole and Jonathan Frieder starting a bit more cautiously. Angell hit the 2 mile marker in 10:02 with a 25 meter lead on Jones and Sydow. Cole and Frieder were 10 meters back. Nothing changed much as they struggled into the wind coming off of the ocean across the Boardwalk. Angell stretched his lead a bit. 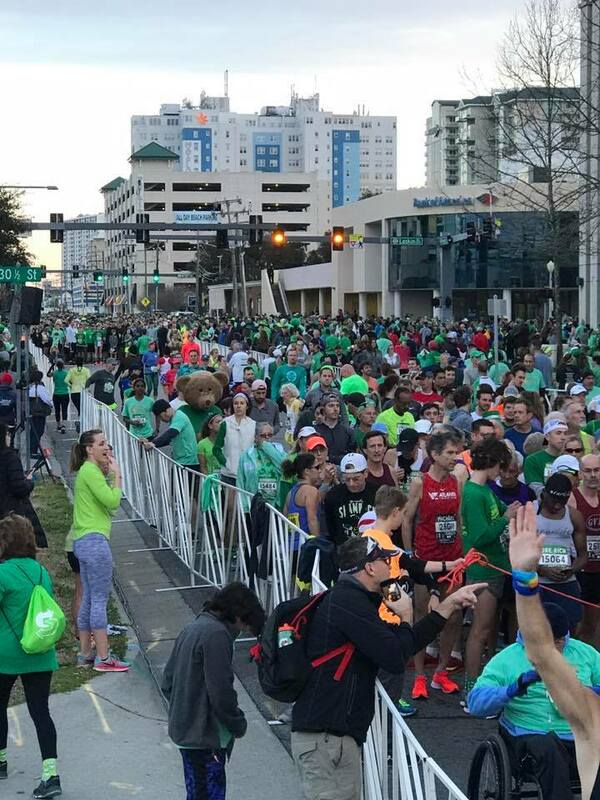 Once the course cut back off of the Boardwalk to Atlantic Avenue, Cole and Frieder closed on Jones and Sydow and tucked in to save something for the final 750 meters with the wind at their back. 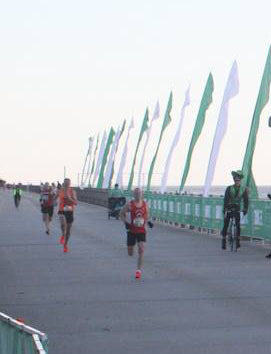 At 4.5 miles, the course takes a 180 back to the Boardwalk to head south for the finish. All 4 were in a pack; Cole eventually made a move to get a couple of seconds on Jones, with Sydow and Frieder trying to match the acceleration. 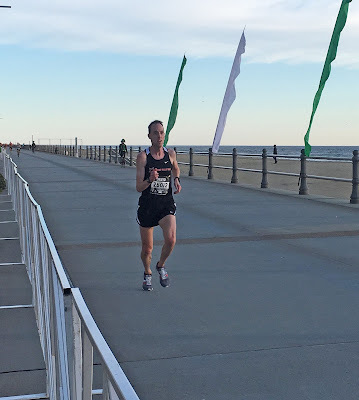 Angell was having no trouble up front and completed his three-peat at Virginia Beach--three races, three overall Masters wins! His gun time this year was 25:40, almost exactly the same as last year. By the finish, Angell had over 40 seconds on the field, his most dominant win of his three. Cole pulled away from the other three chasers to record a 26:21 second place finish. Two seconds later, Jones led Sydow and Frieder across the finishing line to capture the final podium position--What a battle on the Boardwalk that was! Roberta Groner is pointing to the Rotterdam Marathon with a goal of breaking 2:30. In the meantime, this 8K made a good shakeout run for her. She hit the 2 mile mark in 10:35 and cruised up the boardwalk and across the finish line in 26:48, over three minutes ahead of the field. The race for 2nd and 3rd was much closer! Michelle Brangan finished 5th last year, almost two minutes back from Marisa Sutera Strange, who won in 30:40. Brangan returned with the prep and a strategy for a better result this year; she took it out hard when the horn sounded and hit the 2 mile mark in 11:53! Strange started more conservatively and was 25 meters back when Brangan made the turn to the Boardwalk. Not much changed as they battled the headwinds on the Boardwalk. Once they moved over to Atlantic for the final push north, Strange found the distance to Brangan shrinking. She pulled even and then on the final finishing Boardwalk stretch, Strange was able to pull away and establish a 5-second gap by the finish. Strange took 2nd in 30:37 with Brangan taking the bronze medal in 30:42-quite a duel! Suzanne LaBurt and Liz Gottlieb found they could not stay with Brangan and Strange, but had a battle between them for 4th and 5th. LaBurt hit the 2 mile mark in 12:19 with a step on Gottlieb. But racing up the Boardwalk, LaBurt was able to establish a small gap, which widened over the remainder of the race. LaBurt took 4th in 31:15, with almost half a minute lead on Gottlieb who finished 5th. Groner dethroned Sutera Strange as Overall Winner but Sutera Strange took the Gold in Age Grading that eluded her last year when she earned Silver. Sutera Strange, at 55, ran 30:37 to grade at 93.87% , very nearly a full percentage point ahead of Groner. Sutera Strange is a year older and ran three seconds faster than last year; she needed every second to outpoint Groner. Groner, 41, in turn, had nearly a percentage point on Suzanne La Burt, also 55, who ran 31:15 for 91.96%. Patrice Combs, 61, earned the Silver Medal in Age Grading at the Half Marathon Championships. Here she ran 34:29 which converts to an 89.91%, good for 4th place. Michelle Brangan, 49, who was not able to break into the top 10 this year had a much more satisfactory outing, clocking 30:42 for an 87.22 and 5th place. The incredible Nat Larson, age 56, added yet another Age Grading National Championship to his collection; he has won more on the roads than anyone else in the last couple of years. Of the 6 road races last year, he entered 4 and won the Age Grading Championship in each one; he did not contest the 1 Mile nor the Half Marathon. That shows remarkable resilience and consistency. His 26:46 age graded at 94.06%. Tom Bernhard and Roger Sayre both came closer to the American Record for their Age Division than Larson did for his. They did not win the Age-Grading Championship because Age Grading is based on a World Standard. They came close though. Bernhard's 29:49 at age 67 merited a 93.20%, while Sayre's 28:20 at age 61 left him 0.35 % points back of Bernhard. Doug Goodhue, back on his game after rehabbing for a couple of years, ran a 34:22 at age 77 to grade at 92.73%. He finished just off the podium but not out of the money. Rounding out the prize winners was Ken Youngers, 62, who had another fine race; his 29.03 graded at 91.36%. Four of the top age-grading runners came close to setting a new American Record at the 8K for their Age Division. The headwinds on the Boardwalk had an effect. Both Larson and Strange came within 27 seconds of the current American Record for their age division. Strange threatened Shirley Matson's 55-59 record, set in Palo Alto in 1997, with her 30:37. Larson's 29:46 was the same amount of time back from the record of 26:19 he set for 55-59 on November 18, 2017 in Philadelphia. Sayre's 28:19 chip time was within 12 seconds of Norm Green's 60-64 record, set on this same course in Virginia Beach 26 years ago. I wonder what the headwind was that day, if any? Finally, closest of all, Bernhard's 29:47 net time (which would have been 29:46 had he run 0.02 seconds faster) was only 6 seconds off of Joe Fernandez's 65-69 record of 29:41, set in Boston in 1994. That's close! Tremendous races and competition were exhibited in Virginia Beach! 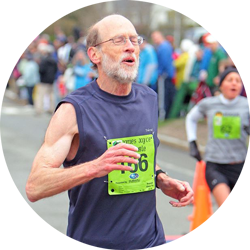 The next post on the 8K Championships will cover Age Division and Team Competitions.